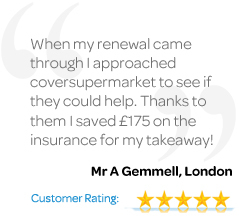 Coversupermarket will compare quotes from the UK's leading restaurant & food insurance companies to help find the best deal for you. Leaving you to cater for the day to day issues. Simply choose your insurance type below, fill out the form & get the cheapest insurance quotes in just 5 minutes!